Truepress Jet520EX Advanced | SCREEN Graphic Solutions Co., Ltd. Targeting the growing need for diversified, small lot printing to create new business. The new Truepress Jet520EX Monochrome Advanced concentrates the core functions required for monochrome printing in a single compact unit that also features a two-fold increase in physical resolution and specialized functions for book printing. It combines various features that precisely meet both the rising need for diversified and small lot production centered around on-demand book production, as well as customer requirements for lower costs and faster turnaround. This versatile system also delivers industry-leading quality thanks to SCREEN’s proprietary inkjet technologies. In addition to improving the efficiency and performance of existing operations, its smooth integration with postpress devices opens up unlimited potential for on-demand book printing and other fields. Outstanding print quality that supports book productionThe Truepress Jet520EX Monochrome Advanced features grayscale printing of minimum 3 picoliters and proprietary screening technology, enabling high printing quality. This system also offers rapid throughput of up to 128 meters (419.94 feet) per minute (comparable to 1,720 A4 pages per minute*), making it a high-spec inkjet system capable of satisfying all requirements. As a monochrome printer, the Truepress Jet520EX Monochrome Advanced enhances the quality of text and barcode output and enables superb expression of the gradations in photos. * When using a dual engine duplex configuration. Preliminary calculation for 2-up duplex printing. On-demand book businessThe Truepress Jet520EX Monochrome Advanced offers both postpress processing capabilities and storage performance equal to offset printing, as well as the flexibility to print single copies. Thanks to its maximum resolution of 720 dpi, it is able to faithfully reproduce even finely detailed text and also offers significantly improved linking with both pre and postpress devices. Despite the great potential offered by on-demand book printing, this field has remained consistently difficult to enter. The Truepress Jet520EX Monochrome Advanced now provides the key to establishing a successful business in this demanding area. 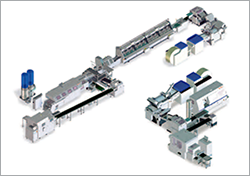 Linking with various book binding machinesReflecting the trend toward diversified and small lot production, manufacturers of binding machines have all released roll paper compatible systems. The Truepress Jet520EX Monochrome Advanced can be linked with various binding machines. This ability reliably meets the needs of many customers related to perfect binding and saddle stitching for minimum lot runs and books containing variable data. SCREEN high-speed roll-fed printing systems can make a major difference to the visual appeal of monthly financial statements, invoices, certificates and other documents. Their outstanding precision and quality also add significant value to customer communications. SCREEN high-speed roll-fed printing systems make it possible to build a publishing and book printing business of unprecedented quality. Our inkjet systems provide variable support even for full color elements with differing text, greatly increasing throughput. 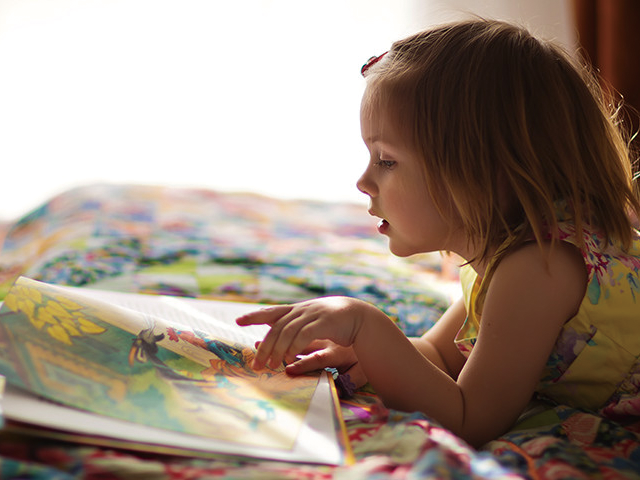 Commercial printing requires high-volume production of diverse materials. 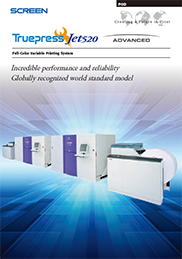 Our Truepress Jet520 series of high-speed roll-fed inkjet systems fully satisfy these needs with their excellent stability, quality and productivity. Their flexible system configuration and wealth of options help to build an ideal business. The Truepress Jet520EX Monochrome Advanced that uses water-based dye inks can be converted to print in color. Please consult your SCREEN representative for details.